Will Labor split help advance Israeli-Palestinian peace talks? Prime Minister Benjamin Netanyahu is determined to speed up the dialogue with the United States in a bid to renew the regional peace process, state officials said Monday night. According to one of the sources, "(Defense Minister Ehud) Barak's departure (from the Labor Party) will make it possible to clarify to the Palestinians that the chance for moving up the elections is far smaller than it was before." Netanyahu, who helped Barak plan the split and the establishment of a new faction, addressed the peace process in a closed forum, saying that "in the end everyone will admit they were wrong". The prime minister's advisors contacted American, Palestinian and European elements in the midst of the political drama created Monday following Barak's announcement, in a bid to clarify that Netanyahu is determined to advance the peace talks. Sources involved in the talks which led to the establishment of the new Independence faction said that Jerusalem briefed Washington on the political situation in Israel. According to the sources, the Israelis clarified that the prime minister will work to resume the peace process in the coming weeks. "Netanyahu will not make any political considerations when it comes to the peace process," a Jerusalem source said. "The prime minister has made a strategic decision to advance to an agreement as long as Israel's security demands are met. He is aware of the opportunity created in his second term and plans to make use of it." Sources close to the prime minister noted that the opposition would back any progress made in the peace talks. "Kadima will be committed to the peace process and to progress made on the Palestinian channel or any other channel," one of the sources noted. 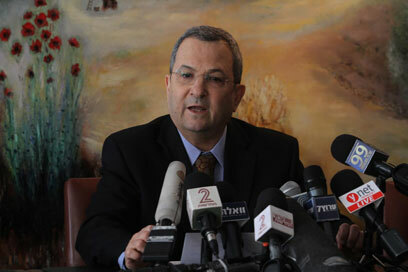 Barak's departure from Labor, the source added, "has made it clear to Kadima that the elections are still far off." See all talkbacks "PM determined to advance peace talks"